Kiss-Cut Sticker Singles look like mini sticker pages, with only one sticker on each mini-page. The sticker can be any shape and size. You can order kiss-cut singles in bulk for best value pricing, or order just one to try! Order in bulk for different materials such as glossy white vinyl, matte, or clear. Easily design and create custom kiss-cut sticker singles in any shape, size and quantity you want. Our precise cutting technology will ensure that you can easily peel away your sticker from the vinyl border and backing. Using StickerYou’s proprietary Sticker Editor online technology, the design options for kiss-cut sticker singles are endless and being able to see your custom design online allows you to create the perfect, one of a kind kiss-cut sticker single. Kiss-cut sticker singles are great for more intricate designs as the backing protects the edges and they are often easier to peel than die-cut sticker singles. You can create kiss-cut sticker singles to any size, exact to 0.1" in measurement, or shape to match the exact shape of your design. Simply upload your image, logo or choose from thousands of images and customer sticker templates and then customize them online to bring your kiss-cut sticker to life. These high quality custom stickers can be used on your laptop, sports helmet or hard hat or for handouts at a special event like brand promo events. StickerYou’s kiss-cut sticker singles are printed with top quality inks only on white or clear vinyl material in glossy and matte to ensure your sticker looks its best and that they are waterproof, weather resistant and dishwasher and microwave safe. StickerYou is a leader in innovative technology and custom sticker printing. 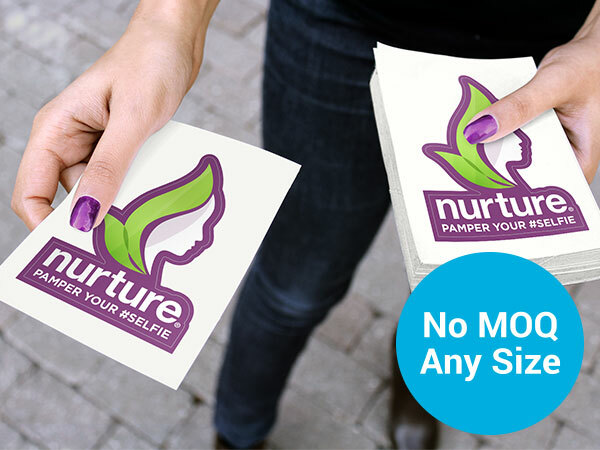 We have a passion for empowering you to get your perfect sticker to bring your business to life or inspire your own personal expression and joy!